"This is a good way to use up extra watermelon, but also a good excuse to buy some watermelon in the first place. I was surprised by how well the watermelon works in salsa." 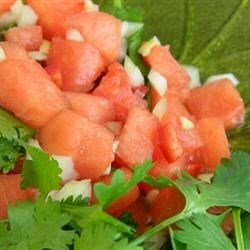 Stir the watermelon, cilantro, onion, jalapeno peppers, garlic, vinegar, and salt together in a bowl until evenly mixed. Cover, and refrigerate overnight for best flavor. Really liked this, added more garlic. It was veryy healthy and pretty, but bland...maybe more garlic and herbs would help? Will make again with more spices. I typically don’t use jalapeños in salsas to match my husband’s taste, but considering a seeded jalapeño. I added lime and more salt to taste. No changes. I wil use a spicier pepper next Everyone loved it.